When you need Trash Removal in Broward County, there is only one call for your to make. Call the experts here at XS Trash for your junk and trash removal experts. Our company has proudly been serving all of our clients with the highest standard of service, at the lowest rates. Here at XS Trash, we have worked hard to serve our residential and commercial clients. We pride ourselves on delivering some of the highest standards of Trash Removal in Broward County service in all of the industry. When you hire XS Trash to do the job, you will not have to move anything. Once we show up, simply point to us what needs to be removed and watch us do the rest. 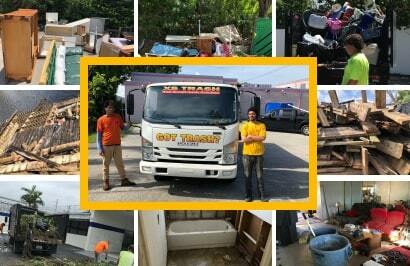 Our trash removal in Broward County company, is licensed and insured in junk and trash removal and disposal. Our company personally hand-picks our team, that ensures 100% pick up. We keep our customers satisfied and coming back with our affordable rates, convenient scheduling and even same-day pick up and disposal service! And we'll haul as little as one item or as much as multiple truckloads. Hire XS Trash today and see for yourself why we are so highly praised and respected throughout the junk hauling industry. We have the experience, knowledge and resources needed to handle any size job. Give XS Trash a call today to learn more information! Licensed & Insured Broward County Trash Removal & Junk Pickup & Hauling.